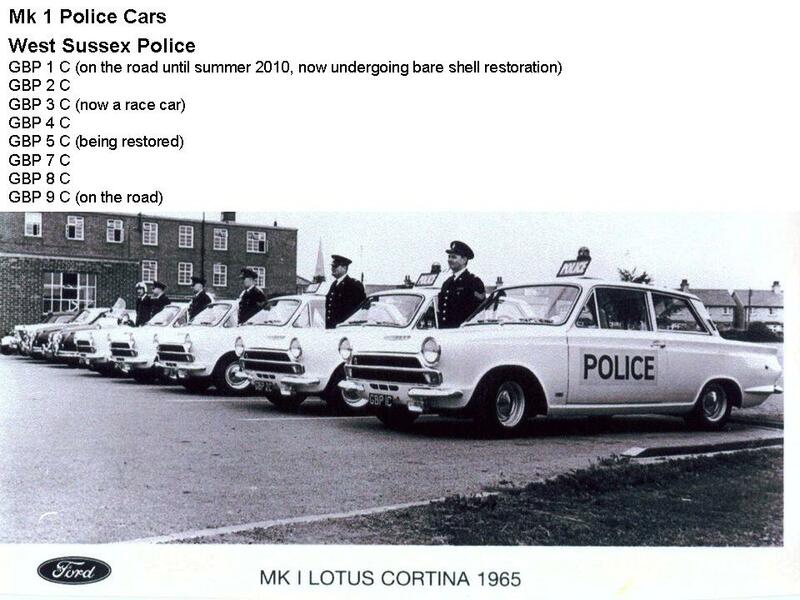 In1964 Graham Arnold, the Lotus sales director, had a bright idea to gain some free advertising; he would get a mock-up of a Police squad made up for some publicity shots for the marque. One dark night, at around 11:30 pm, he turned up in it at his local pub near Cheshunt where he knew you could always get a drink any time up to midnight from the landlord who was a well known character in the Lotus factory. The car hastily drew up outside with compressed air sirens going & blue lights flashing and within minutes the pub was in total darkness and shadowy figures could be seen making a quick exit via the back door. Graham Arnold’s Mock-Up Police Car. 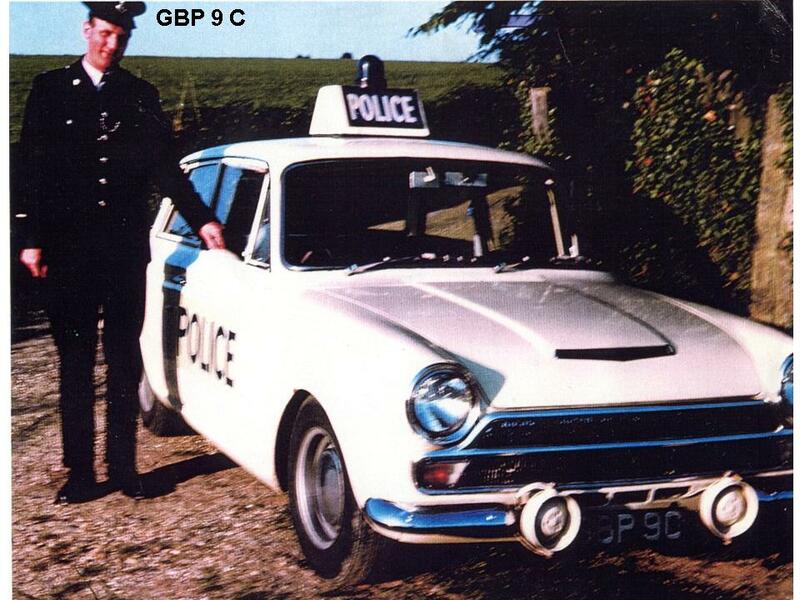 It was the official launch car for the S/E package early in 1964 as well as a general ‘hack’. 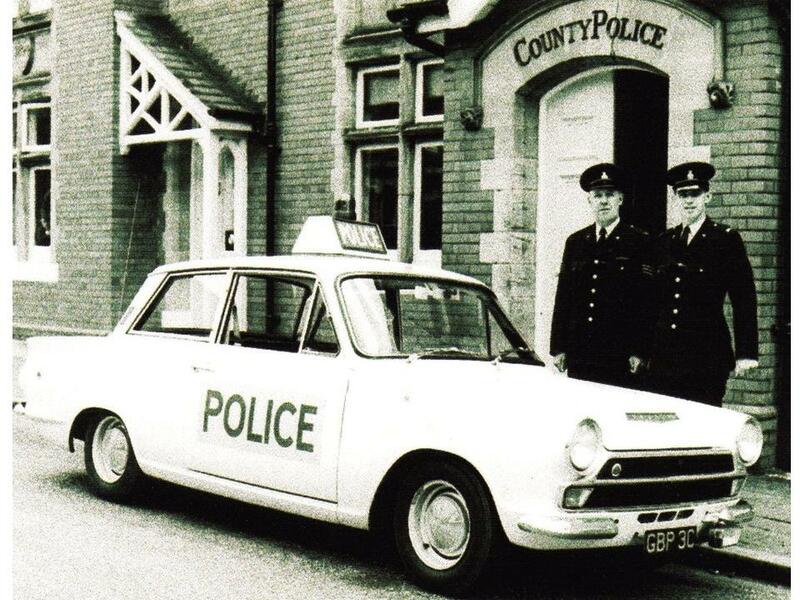 Meanwhile, back in Chichester, West Sussex, the county’s Police Transport Manager Christopher Williams was looking for a more cost effective alternative to running their fleet of Mk2 Jaguars as, in those days, you could get three (base model) Cortinas for the price of a Jaguar Mk2. He arranged a visit to the factory and the rest, as they say, is history. 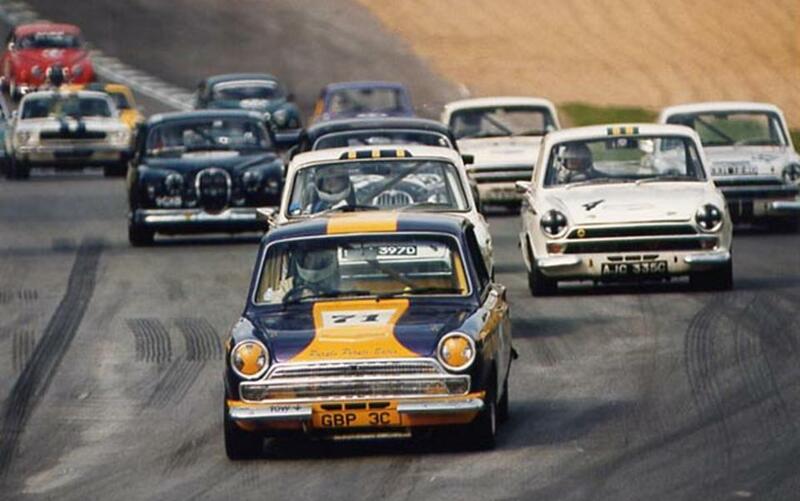 You can see GBP 1 C along with its peers, in the now famous line up photograph that is in many of the Ford marque books and Miles Wilkins’ book on the Lotus Twincam engine. 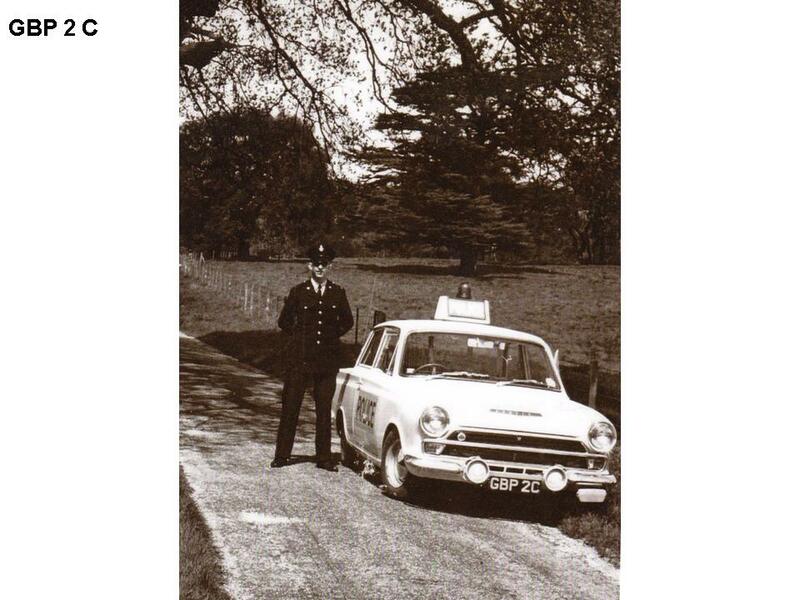 The cars were used from 1965-67 by West Sussex Constabulary, and the Chief Constable of the time thought it would be “great for recruitment”. 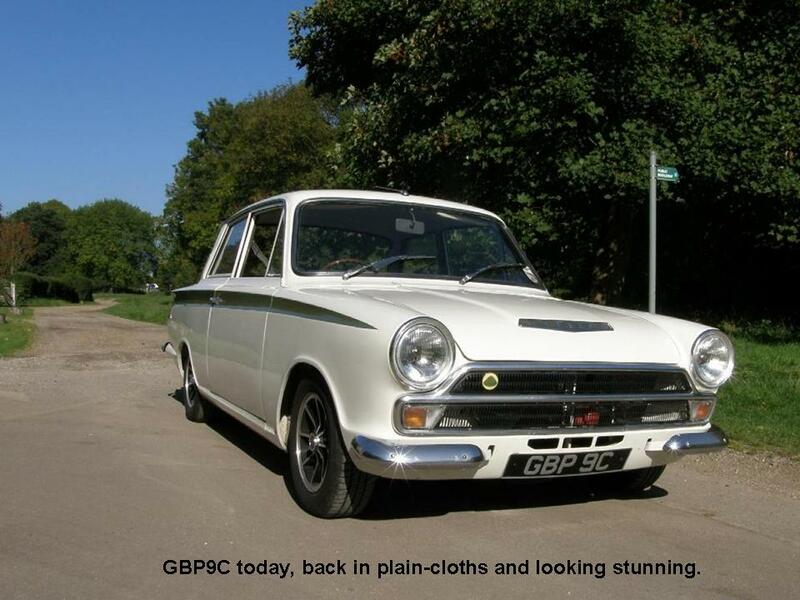 GBP 1 C was built in June of 1965 as an airflow model & although these cars were thought to have been built as A frame cars, they were actually early releases of the later leaf spring car developed between Ford &Lotus…… June was the change point from ‘A’ frame to leaf spring. 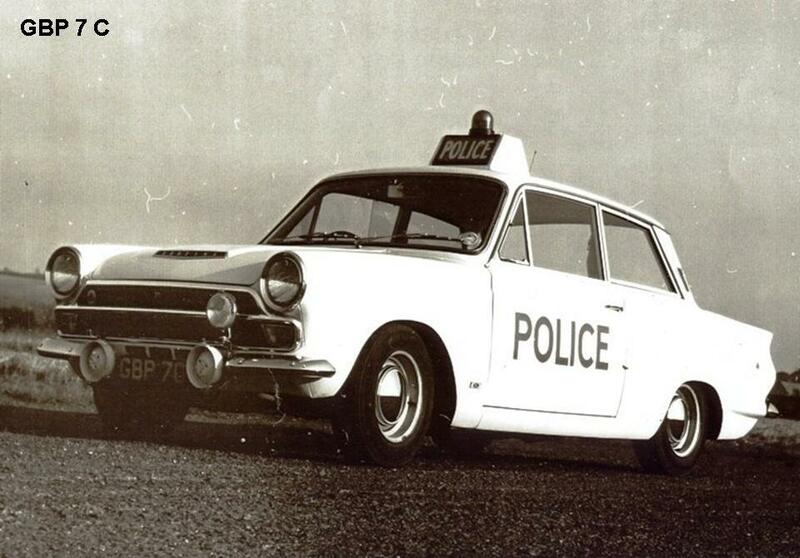 The A frame cars were notoriously unreliable and suffered regularly from leaking diffs and would not have been a popular choice for the rigours of Police patrols. The cars ran an alternator instead of a dynamo to cope with the host of extra electrical equipment. 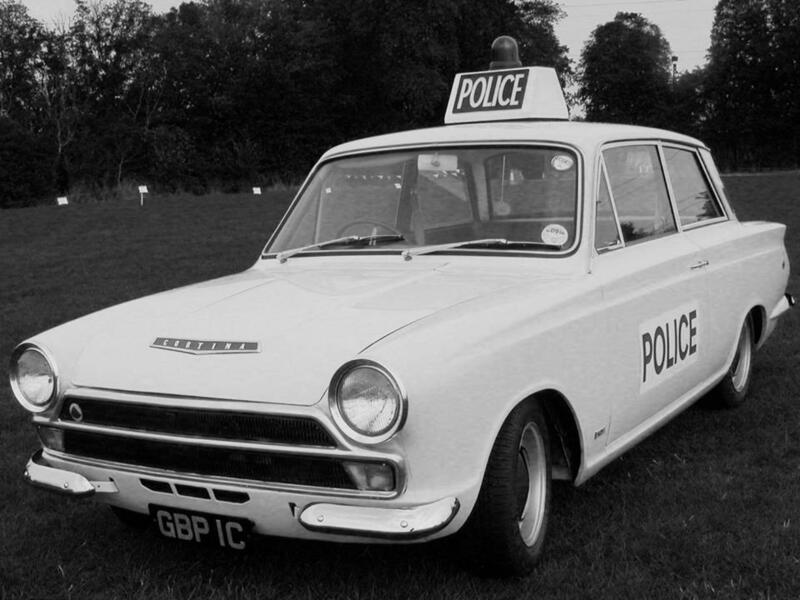 Other extras included air horns, a top POLICE box with blue rotating lamp and STOP sign, passenger rear view mirror, two way radio and speaker, aerial on the boot valance, fire extinguisher, map reading light, transposed speedo and rev-counter so that the passenger officer could better clock the speed of the pursued vehicle. The colour scheme was restricted to Ermine White to make sure the car was more of a deterrent to offending road users. Superintendent Edward Post said “We have adopted a white finish so that our vehicles will have a greater all round impact on the motoring public. The black Jaguars with small POLICE signs are usually noticed only by the motorist immediately in front or behind, but the new ones can be seen by many more car drivers at the same time. Our idea, in other words, is that every Police vehicle should have a much greater deterrent value”. GBP1C to GBP 5C were delivered from a Ford dealership called Rowes of Chichester in June and later on that year came GBP 6C, 7C & 9C. In 2013, Robin Sharp, a Patrol Officer based at Chichester, provided a cutting showing that GBP8C had caught fire in Chichester in 1966, and was probably scrapped. The other cars had a short two year life in active service, being used 3 shifts a day seven days a week, covering around 350 miles a day; so they never actually got cold. 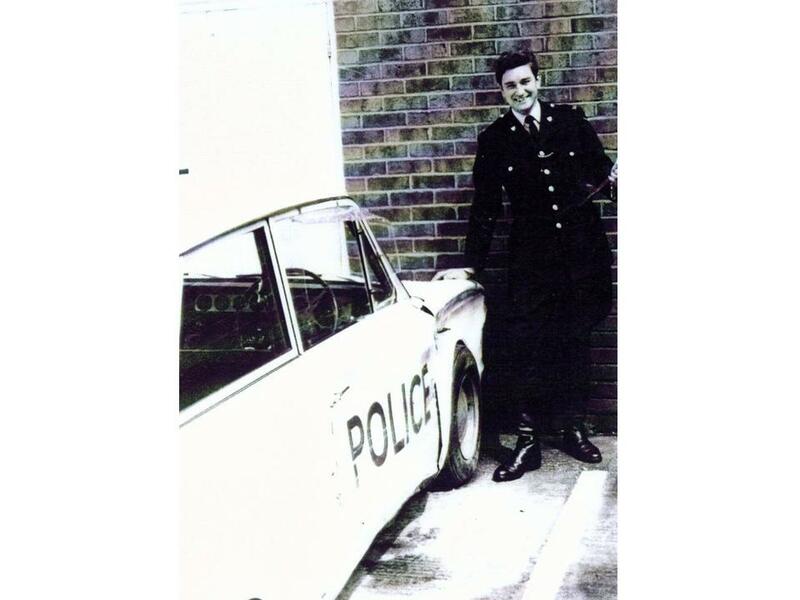 Peter Tompsett was one of the original drivers of the time and at first didn’t warm to the idea of driving a Ford Cortina over a Jaguar, as he was expecting the luxury of leather seats under his serge uniform and not cheap black vinyl. But, as soon as he felt the rapid acceleration and heard the throaty rush of the Weber carbs, all was forgotten. 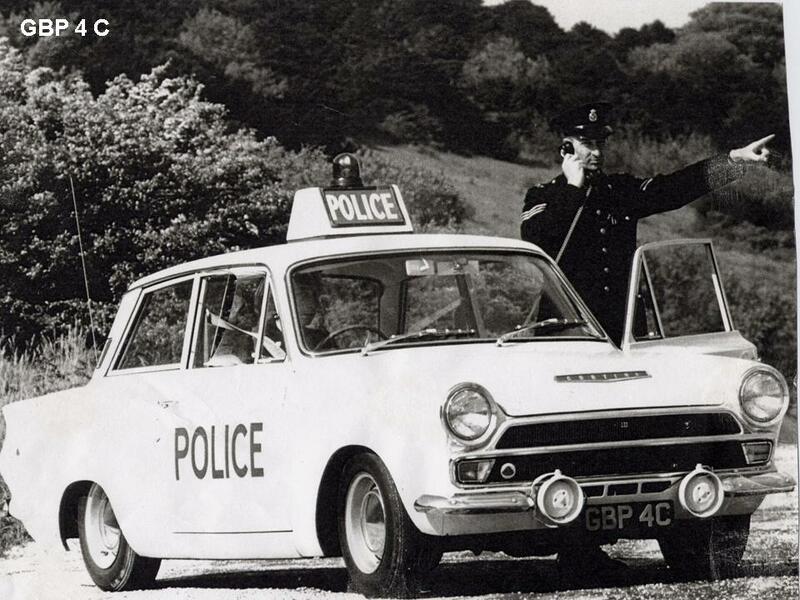 It was rumoured that the Police drivers would hold the pedal to the floor and only change gears when the rev limiter had cut out the engine. Other accounts talk about 120 MPH chases where the doors would flex allowing daylight to appear through the gaps between the frame and guttering. These cars were regularly serviced at a local garage and one of the mechanics, who was an apprentice at the time, said that they would all clamour to drive them when they came in for repair work or servicing, which must have been quite frequent considering the high mileage. 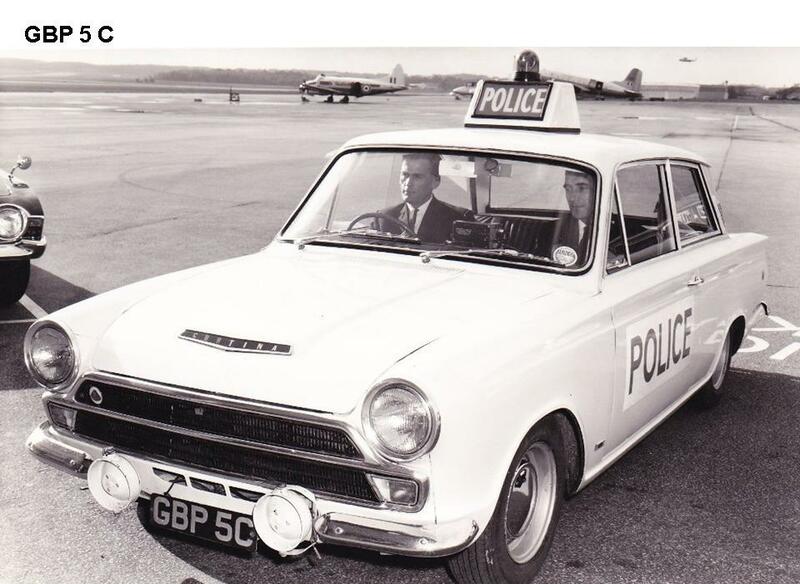 One of the fleet of cars had a call sign of 007 and it was round about the time of the release of the James Bond movies, so as the car had loads of accessories, it was likened to the trick cars in the film and was a source of amusement when the PA system was left on. 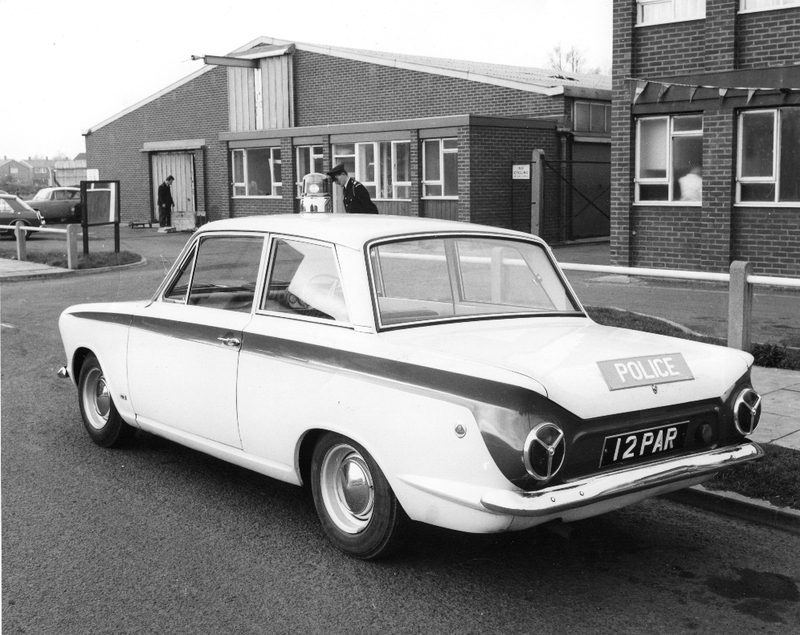 Eventually, in 1967, their time in service came to an end and the fleet was replaced by Mk2 Cortinas and the surviving Mk1s all went off to auction. One high speed chase culminated in the destruction of the offside front wing as shown in the picture taken with the driver, Peter Tompsett, shortly afterwards. 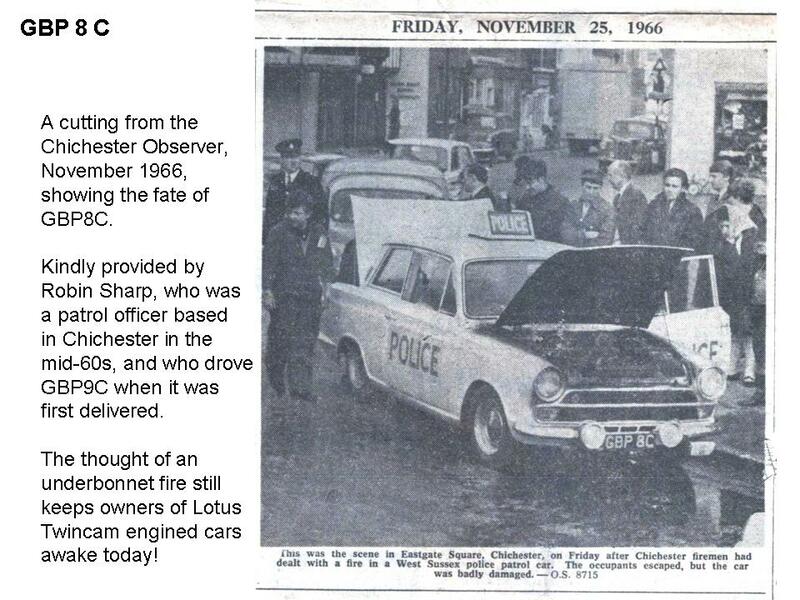 They were on patrol one wet night between Horsham and Crawley on the A264 when a man overtook on the brow of a hill, but despite getting the Lotus onto the grass verge, they collided with him spinning the Cortina through 180 degrees and through a hedge, demolishing the drivers’ side wing & door. The person who originally bought GBP 1 C from the auction kept it from 1967 to 1969 and sold it on to a man in Brighton who sold it on once again in 1975 for £285. This time it went to a student who used it to get to and from college and he then sold it to a college mate in 1975 for £250. 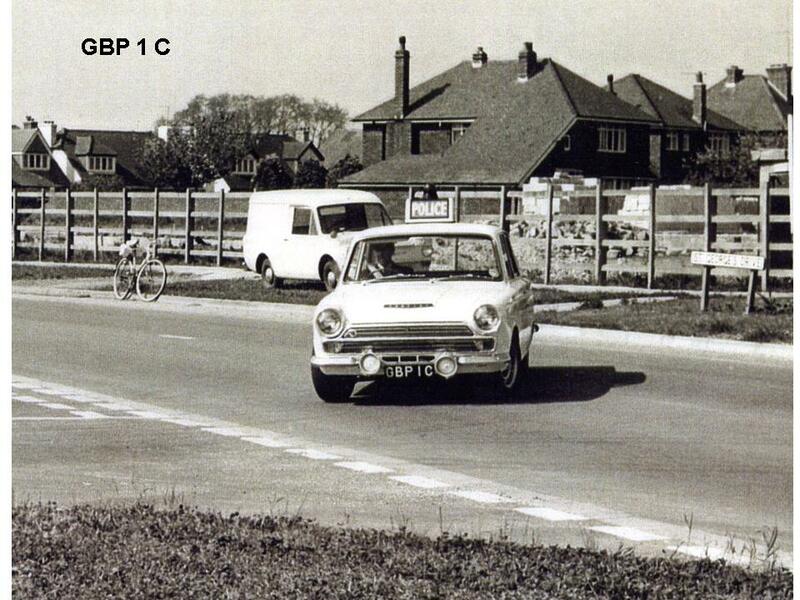 The next time it changed hands was in 1977 and by this time had a 1600 Crossflow engine fitted as the twin cam had been stolen while it was garaged for a while. During this period, it had an under-bonnet wiring fire and was rescued from the breakers just in the nick of time (pardon the pun). It was sold on in 1978 and again in 1981 for £300 when it reached the next owner who had it for 17 years and did the major restoration work on it, culminating in winning awards at shows in 1993/4. By now the chassis was in a terrible state, so it has been extensively welded and many panels were replaced. By this time it had a rebuilt twin cam engine and was in the traditional livery of Ermine White and Sherwood Green stripe. The car sounded really rough at this point as the cam timing was one notch out on the exhaust sprocket – apparently this was the only way it would run. 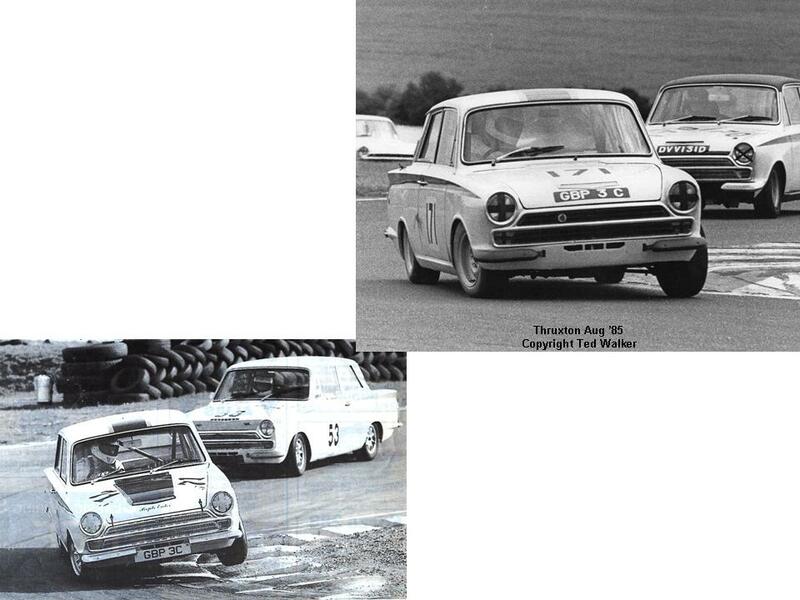 An old advert in the Lotus Cortina Register magazine back in 1996 shows it for sale at £9,500. 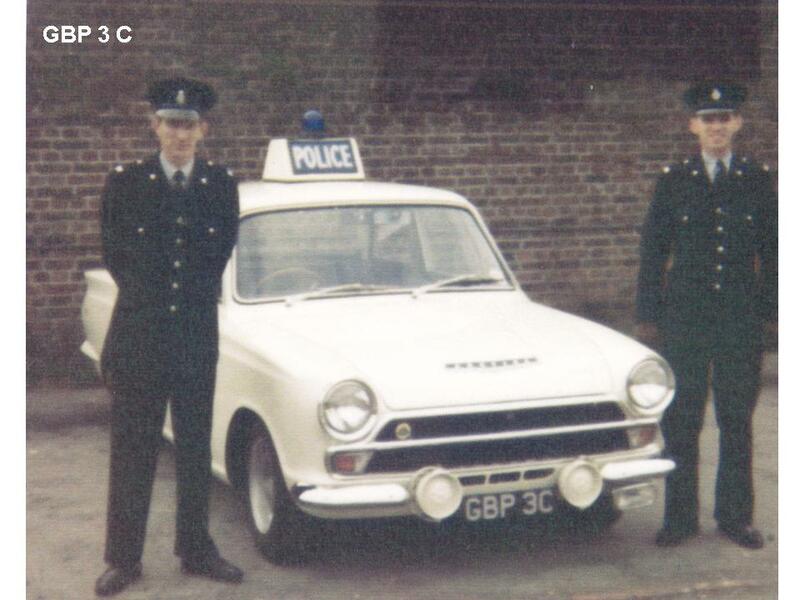 It was later sold to a dealer in 1998 and again in 1999 to a LCR member who restored it once more to the correct Police specification thanks to the assistance of the Police vehicle owners club who helped to source all of the unique parts like the roof box for the princely sum of £30 – result! The restoration was only partial, due to personal circumstances, but resulted in winning the LCR best car prize in 2001. In late 2001, it was sold to Keith for £11,000 and he immediately had a disaster with the clutch thrust bearing exploding and causing him to suspect the worst. He dragged out the engine and decided to detail the complete engine bay while he was there. Once he had repainted the under bonnet area, he came by a replacement engine via a friend who was an apprentice of Colin Chapman and he had a totally unmolested unit sitting in his workshop since the 1970s when it was taken from another car to be used as spares. After a quick honing & a new set of rings it fired up a treat. He then set about rewiring the car as it had let him down on several occasions. He traced the old ammeter which was taped up under the dash, and fitted a new loom from Autosparks. The interior was refurbished with airflow leather seats, Aldridge door panels, repro dash binnacle and a new set of carpets. The engine, a 6 bolt Mk 2 version, was subsequently rebuilt with CPL2 cams, a +040 bore and Lumenition Magnetronic ignition system, and now develops around 126 BHP. 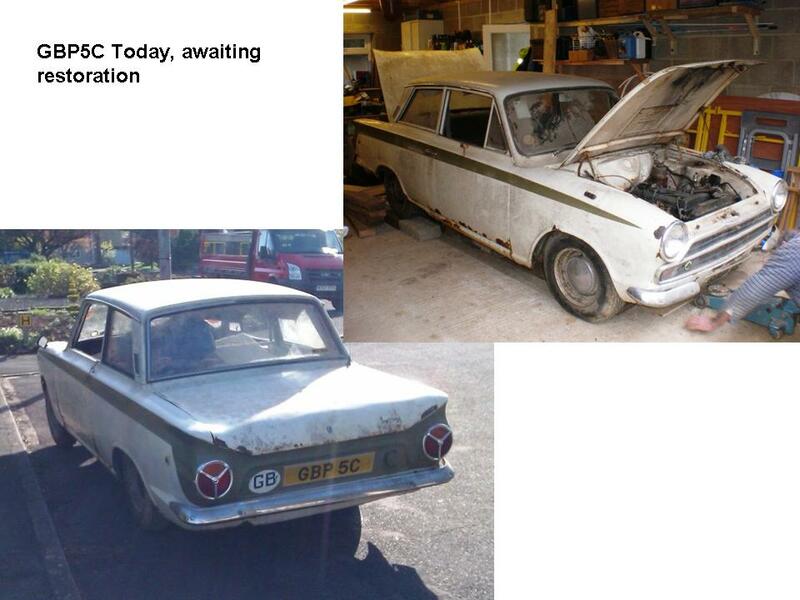 In 2012 GBP1C was taken off the road and treated to a complete bare-shell restoration by THE Mk 1 Lotus Cortina specialist Colin Ginn from Clacton-on-Sea, Essex. 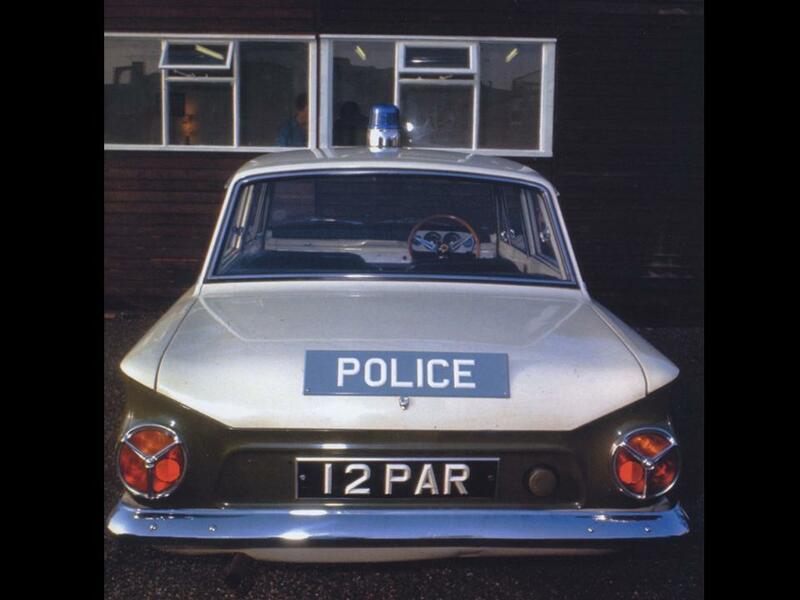 The restoration is complete, and the car is now in showroom condition and in full Police livery.